The renowned actress treats her friends to a dinner. Nollywood actress, Rita Dominic, turned 43 on Thursday. 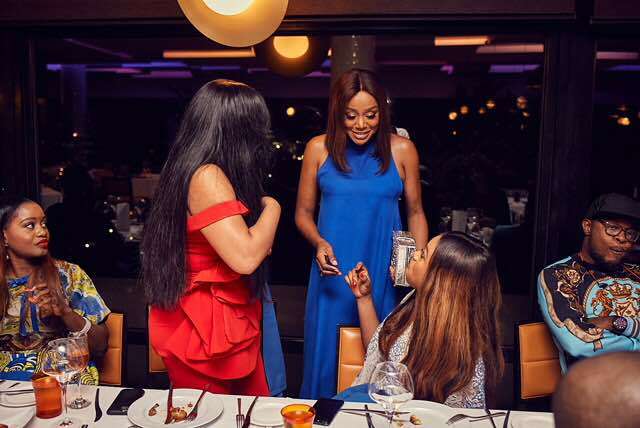 To celebrate the day, she treated some colleagues and friends to dinner at the Sky Lounge and Restaurant in Eko Hotel, Victoria Island, Lagos. Celebrities like Michelle Dede, Femi Jacobs, Blessing Egbe, Lanre DaSilva and more were at the birthday dinner. Rita is the youngest of four siblings. She attended Federal Government College,Ikot Ekpene, Akwa Ibom State, and then the University of Port Harcourt where she graduated with a Theatre Arts BA Honors’ Degree in 1999. Rita started performing when she was a child, appearing in school plays and children’s television shows in Imo State. In 1998 she starred in her first movie, A Time to Kill. She has starred in over 100 Nollywood productions. She was awarded Best Actress -Drama/TV for her role in “’76” at the 2017 Africa Magic Viewers’ Choice Awards.